Besides the efforts that are of descriptive and celebrative nature, studies related to Sri Lanka’s historical built heritage are largely to view material remains in historical, sociological, socio-historical and semiological perspectives. But there is hardly any serious attempt to view such material remains from a technical-analytical approach to understand the compositional aspects of their designs. The 5th century AC royal complex at Sigiriya is no exception in this regard. The enormous wealth of information and the unearthed material remains during more than hundred years of field-based research by several generations of archaeologists at Sigiriya provide ideal opportunity for such an analysis. The present study is, therefore, to fill the gap in research related to Sri Lanka’s historical built heritage in general and to Sigiriya in particular. Therefore the present research attempts to read Sigiriya as a landscape architectonic design to expose its architectonic composition and design instruments. The study which is approached from a technical-analytical point of view follows a methodological framework that is developed at the Landscape Design Department of the Faculty of Architecture at Delft University of Technology. The study reveals that the architectonic design of Sigiriya constitutes multiple design layers and multiple layers of significance with material-spatial-metaphorical-functional coherence, and that it has both general and unique landscape architectonic elements, aspects, characteristics and qualities. The richness of its composition also enables to identify the landscape architectural value of the Sigiriya, which will help re-shape the policies related to conservation and presentation of Sigiriya as a heritage site as well as the protection and management as a green monument. 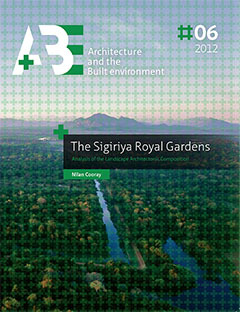 The positive results of the study also underline that the methodology adapted in this research has devised a framework for the study of other examples of historical gardens and landscapes of Sri Lanka, which will eventually provide insight into the typological aspects of the possible Sri Lankan tradition of landscape design.